For each issue of Literary Mama, Literary Reflections shares a writing prompt, inviting our readers to respond. Our editors provide feedback on the responses we receive, and we post our favorites on the blog. 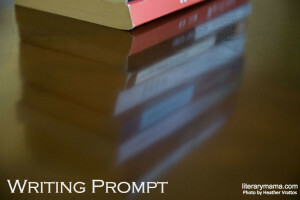 This month's writing prompt is inspired by Cindy House's essay, Comfort in Stories. "I needed to fall into something worse than my own reality. I needed perspective. I needed to understand that humans had survived far worse than depression and had even gone on to write about it." "We all want to give our kids the benefit of lessons learned from our own lives. I could not tell my son how to navigate a divorce at his age . . . But I could show him that there is comfort in stories . . . that sad stories, which have nothing to do with our own in the details, can still show us the way." Is there a literary story that has provided comfort to you or someone in your family by giving you a new perspective or making you feel less alone? We invite you to tell us about that story and its powerful impact. Read House's essay and submit a 500-word response to this writing prompt by October 4, 2017, for feedback from our editors. Email it to LMreflections (at) literarymama (dot) com and note "September Prompt" in your subject line. Please do not attach the essay but paste the response in the body of the email.